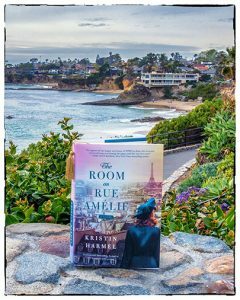 The Room on Rue Amélie by Kristin Harmel is a heartbreaking and inspiring tale of love, loss and survival during the tumultuous times of World War II. I have always found stories based during this era of time to be extremely emotional. I think the one thing they all have in common is how we get to see the best and the worst of humanity simultaneously. Its distressing to just read about the horrors inflicted on humans during that turbulent era, and yet it is also comforting to know that even amidst those dark times, kindness and compassion was not lost. The Room on Rue Amélie tells the story of Ruby, an American in Paris; Charlotte, an eleven year old Jewish girl and Thomas, a British RAF pilot, and how their lives get interlaced with each other. I believe Kristin Harmel has beautifully captured that bleak age and put into words the fears, hopes and dreams of these three very different characters. It could be majorly classified as a romance, but I believe it is so much more than just that. I don’t want to say much about the story, what you read in the blurb is sufficient, just know this, that in the midst of all the gloom and oppression, towards the end, it reprises the goodness of mankind, strength of faith and the enduring power of love. There is danger, drama and a depth of feeling that’ll stay with its readers. To all historical fiction and romance readers, I’d definitely recommend this. Discalimer: I was sent a free finished copy of this book by Gallery Books. All opinions are my own.